I have shared our love for Rice Krispies in the past, and I am promoting Kellogg Canada's Spring Edition Rice Krispies as an unpaid member of the Kelloggers blog community. I received Rice Krispies Squares Minis and a few other items to make treats. Rice Krispies treats are our favourite treat to make, eat, and share. This Easter we will be making Rice Krispies birds nests and egg shaped treats for dessert, using the new Spring Edition Rice Krispies. The best part is, the Original Rice Krispies Treats recipe will make both desserts, the birds nests are shaped in muffin pans then topped with jelly beans or small egg shaped candies, and toy plastic eggs make the egg shaped treats. I didn't do egg hunts as a child. On Easter Sunday morning, a basket of treats were left for each of us kids. If you do egg hunts, the large plastic eggs are also a great hiding place for Rice Krispies Square Minis. Do you have Spring traditions too? *I am posting as part of my involvement with the Kellogger Blog Community and occasionally receive free product. All opinions remain honestly my own. I've had serious health problems this year, so I'm being monitored by a team of specialists... there's not much more that I can do. I like to keep a bag of dried fruit in my bag for snacks on the go. I keep fruit, yogurt and granola bars handy for snacking. I am taking care of my health by eating more fruits and veggies! And I love snacking on fruit lately! This year I am walking more and trying to drink more water. My snack attack food is breaton crackers and laughing cow cheese! :) Thanks! 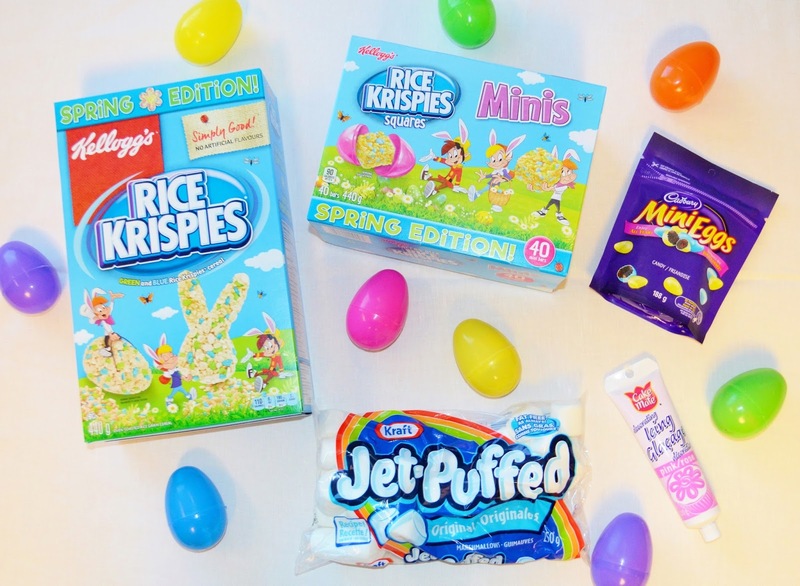 Rice Krispies Spring Edition Prize Pack. How are you taking care of your health this year? and Which snack do you love to have handy for snack attacks? and i stopped smoking cigarettes. I like to have a Granola Bar handy for snack attacks. Granola bars are my go-to for snack attacks. I love to run so that's how I'm keeping in shape. My favourite guilty pleasure treat is sour cream and onion chips with dip! I'm trying to go for daily walks and to get a better night of sleep. for snack attacks, trail mix is a fave! We keep the fridge full of cut veggies and fruit for us all to snack on! I have started seeing a personal trainer this year to get strong and more flexible! I love keeping a big salad in my fridge that I can snack on. I am taking care of my health this year by getting more exercise. I love having Rice Krispies Treats for my snack attacks. Hummus and veggies is usually on hand for my snack attacks! I'm trying to eat healthier and take care of myself. I'm only slightly successful. I snack on nuts and berries, usually. Trail mix. That sort of thing. I am trying Yoga this year to add exercise into my weekly routine. I am taking care my health this year by drinking more water and exercising more. I like to have dried mangos and yogurt for snack attacks. I want to exercise more this year so I can stay healthy! I love to have yogurt and bananas ready for snack attacks,,trying to eat healthier!! I love to have granola bars handy for snack attacks. I try to eat healthier snacks and usually try to have a homemade bits and bites mixture or rice krispie squares on hand. Eating lots of fruit and veggies plus for healthy snacks I have apples and cheese. We have an Easter egg hunt followed by Church Services and then a nice meal. Making the cute birds' nests with my girls sounds like a new tradition to add in. I try to ensure that I eat snack foods in moderation. Try, I said. I am trying to be healthier by not eating salty snacks in the evenings. I have given up potato chips for the past year & now I eat fruit, nuts, or veggies with dip. I like to have fruit on hand, especially oranges. I like to have a apple or banana. I'm using a FitBit this year to aim for 10 000 steps a day!! I like to have almonds and cheese when I need a snack. fresh fruit is the very best healthy snack ! I'm focusing more on my health by eating better. I like to snack on fruit, veggies and yogurt but once in while I like a treat and rice Krispies square are a good treat! My main focus is trying to reduce my coffees. More because of all the junk I put in it (literally sometimes actual chocolate) than the caffeine. But that too. Ive been prone to anxiety. I am drinking more tea and water instead of sugary drinks.